As LIBATION builds up to its 10 Year Anniversary this coming April, expect the long running NYC dance party to pull out all the stops!!! On Thursday, February 25th, LIBATION returns to DROM to team up with another long running force in Gotham nightlife, SOULGASM!!! 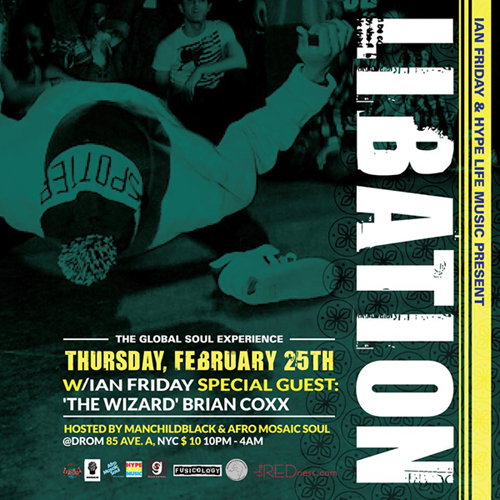 Libation resident IAN FRIDAY (Global Soul Music) will be joined on the decks by Soulgasm resident, ‘The Wizard’ BRIAN COXX, as both party brands celebrate 10 years of making NYC dance!! !